Shutters are the ultimate in window treatment luxury, unlike other styles of window dressings they are full customised cabinetry products with each panel individually crafted to integrate with your living space. They have a timeless appeal and offer a choice of different design elements suited to all tastes from contemporary to traditional settings. Shutters are available in hinged, sliding or bi-folding configurations and can be tailored to include arched, angled or porthole type windows. 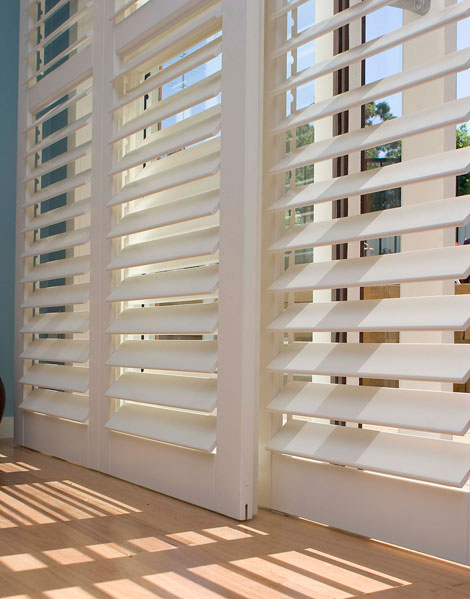 Shutters are ideal for controlling the elements of light and shade as well as excellent products to allowing ventilation and privacy at the same time. Made from Western Red Cedar or Basswood timber a well made and professionally installed shutter is one of the best assets in your home. External shutters are also available in Western Red Cedar and Aluminium.